"Digital Distributed Antenna System For Public Safety Communications"
In today’s emergency services operation, reliable public safety communications are essential from dispatch to mission critical situations and from voice only capabilities to voice and data. Public safety communications have evolved from fire call boxes, analog land mobile radios (LMR) to digital LMRs and trunked radio systems. Therefore, a flexible, future-proof and reliable solution is required to satisfy the current requirements and future, next-gen public safety in-building requirements. 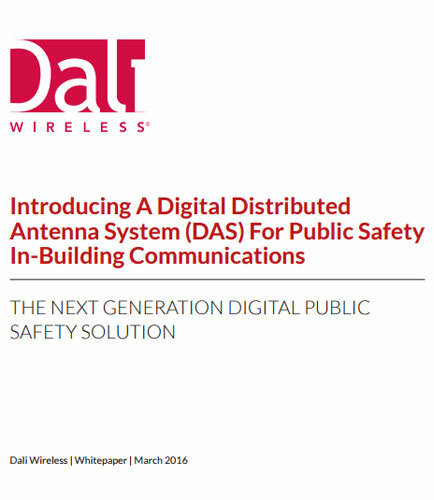 Hence the Distributed Antenna System approach enables public safety operators and integrators to meet today’s voice and data requirements while providing them with a seamless migration path to address the evolving needs. Helping retailers provide a seamless digital experience Continuing innovations in store technology that transform the retail experience, powered by mobile apps, API design management, interactive displays, and other elements are designed to fit together with digital services and big data insights into a cohesive whole. This whitepaper provides insights on how leaders can be successful by creating a business-led portfolio of API services that consistently deliver comprehensive services at any touch-point. It discusses: Digital experiences are critical for retailers IT faces many obstacles to delivering a cohesive API services portfolio Accelerate digital retail with the API service design platform Without the API design management, your firm is destined to struggle to deliver the omni-channel experiences your customers are demanding.